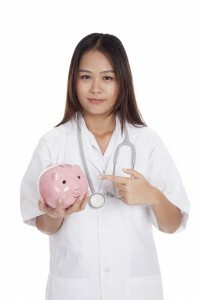 Many physician lenders offer some unique ways of looking at your income. Often the guidelines for determining your employment are more flexible than your typical Conventional Loan. When researching a mortgage for doctors consider your options. –W2 Employee: Physician is a W2 employee of the company with a guaranteed salary. –Member of a Partnership: As long as your membership is 25% or less, banks usually treat you the same as a W2 employee. –Self Employed Sole Proprietor or Owner of LLC with less than 1 year of self employment: Often permitted as long as you have a contract with a hospital clearly outlining a guaranteed pay. For example a guaranteed hourly rate with a guaranteed minimum hours per week. –Self Employed Sole Proprietor or Owner of LLC with 1 year of self employment: There are a few doctor lenders who will consider a self employed physician with less than 2 years of self employment. You must have filed at least 1 year worth of self employed tax returns. The bank will calculate your income using the previous year’s tax returns along with your current YTD Profit & Loss statement and Balance sheet. –Self Employed Sole Proprietor or Owner of LLC with at least 2 years of self employment: This is the common standard for self employed borrowers accepted by most banks. The lender will want your last 2 year personal and business returns, your current YTD Profit & Loss and Balance Sheet. If starting new employment within the last 12 months or are soon to be employed in the future: Provide fully executed employment contract showing start date and guaranteed salary. If just coming out of medical school with no prior work history, provide a copy of your school transcripts. Discussion: Have any of you encountered a lender who has a special take on calculating your income other than what is shown above? Was the program especially useful? My wife and I have an annual income of 110k but a total of student loan debt at 70k with additional debt 10-15k (car loan, credit cards, etc.). My question, is this too high of a debt/income ratio for us to get a first time buyer home loan? Also our down payment percentage probably wouldn’t be too great. We’re wondering if we should pay down debt at a higher rate (our current action) or save more for a down payment? The debt to income ratio is based on your monthly payment obligation, not your outstanding debt.by paying down revolving debt this would help to improve your credit ratings and lower your debt ratio. For most mortgage programs will requires a 41% DTI or less. On some dr loans the max DTI is 38% This can also be higher based on other circumstances. As an FDIC back institution we do have some lead-way in how we lend.